The demands placed on woodworking machines are high: They must be easy to operate, make optimum use of the material, and withstand complex movements. At the same time, buyers are also looking for durability and low energy consumption. Bosch Rexroth offers high-performance components and multi-technology systems for woodworking machines that work reliable even in the harshest conditions. 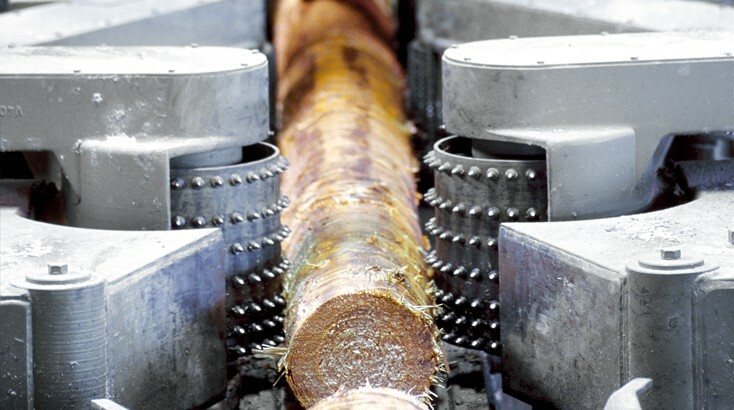 Whether it is wood cutting at the sawmill or CNC-controlled wood working - Bosch Rexroth offers users easy-to-operate systems that increase the degree of material utilization through predefined solutions. Take, for example, the scroll saw: It measures the natural geometry of logs and calculates the best possible cut lines. Hydraulic axes from Bosch Rexroth bring the saw blades into the right position. This enables an efficient use of materials at higher throughput. The largely maintenance-free hydraulic system also satisfies the requirements in terms of durability in a rough environment. In addition, Bosch Rexroth's portfolio includes electric drives and control technology, linear motion and assembly technology as well as pneumatics - all relevant technologies for increasing productivity in woodworking. Through Bosch Rexroth, manufacturers of woodworking machines have access to an extensive range of components and systems. Bosch gives advise to its customers from a technology-neutral perspective. This means that OEMs will aways receive the best possible system solutions for the respective needs. At the same time, the systematic implementation of Rexroth 4EE – Rexroth for Energy Efficiency – lowers energy consumption.